70% of people feel, at some point in their career, that they are not worthy of the job they are doing. Feelings of being found out, of being exposed as a fraud lead to huge amounts of stress and often burn out, as you work extra hard to keep ahead and on top of everything. The more successful you become the more intensely you can feel like an ‘imposter’. 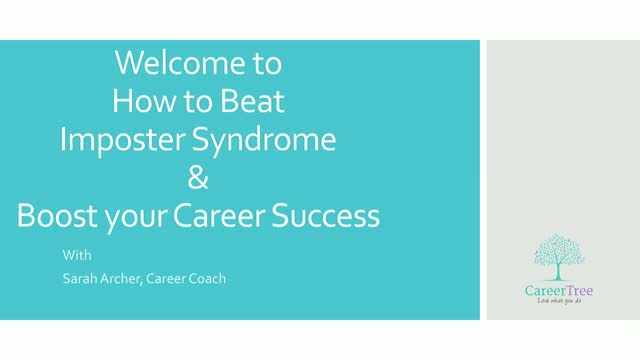 But you can beat Imposter Syndrome, and Sarah Archer, Career Coach and author will take you through the steps and techniques she uses with her clients to banish these feelings and actually enjoy your career and your success. Sarah coaches women to develop a positive mindset, be confident and stop playing small. She is committed to enabling women to show up as their best selves and be successful in their careers on their terms.